Around midnight on September 22, 1989, Hurricane Hugo came ashore near Charleston SC and moved rapidly inland. I flew through Charlotte just a day after Hugo moved through and was amazed at the damage in the area I saw from the air and how red the rivers were running with all the eroded clay soils in the area from the heavy rain. It’s probably no surprise that the airline was having trouble getting flight crews to the airport and that many flights were delayed. The National Weather Service in Charleston produced this web site in 2004 describing the storm at http://www.weather.gov/chs/Hugo25thAnniversary. 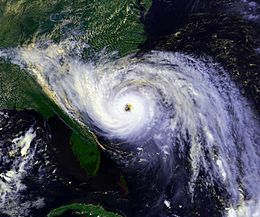 The Wikipedia article on Hugo is at https://en.wikipedia.org/wiki/Hurricane_Hugo. Posted in History, Tropical weather. Bookmark the permalink.